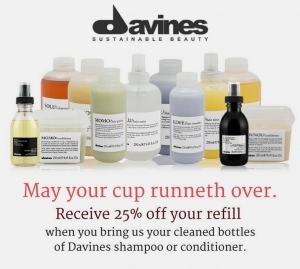 We want to do our (little) bit for the environment, and we’ve teamed up with Davines to offer a unique ‘refill’ service for all of our Davines fans. Simply bring your old bottles of davines into the salon, either when you come for a hair appointment, or if you are just passing (we’ll even make you a coffee whilst you wait), and we will refill for you. Not only does this allow you to help the planet by reducing the amount of plastic waste, it also saves around £4.00 on every bottle refilled – now thats what we call a win-win!